Due to the late release of Star Wars in Canada, the Dewback from A New Hope was released in Canada in an ESB box. The first release was a regular Patrol Dewback in ESB packaging. The second release was a Special Offer version that included a Stormtrooper figure. The Special Offer advertisement was printed on the box. 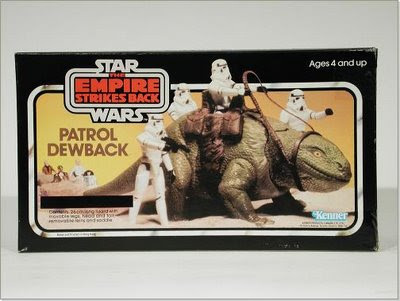 The third version of the ESB Patrol Dewback came without the Stormtrooper action figure and the print on the box was covered with a printed black bar.